Takeaway: A reverse osmosis system can help keep unwanted contaminants, pesticides and bacteria out of your grow system. Chris Bond explains how the process works and offers up some other water purification alternatives. Reverse osmosis, often abbreviated as RO or R/O, is a process in and of itself, or part of a larger system of water purification. Reverse osmosis can remove a wide range of contaminants potentially found in both private and public water supplies. It is most well known as a treatment for rendering water potable (often in combination with a water-softening system) for private drinking systems but has several other applications as well. The process is used industrially to clean waste water before discharging it and for desalinating ocean, sea, or brackish water for desired use. It can be used for any application that requires removing any solid material(s) or dissolved solid materials from water. Well designed systems will remove between 95 and 99 percent of contaminants and particles. The reason for using RO can be generalized by saying it is used whenever one needs to remove anything affecting the color, taste, smell, or quality of water. More specifically, it can remove unwanted and dangerous pesticides such as 2-4D, Lindane, and Atrazine, as well as metal ions like mercury, cadmium, copper, and aluminum, as well as particles such as asbestos. It is widely used by both homeowners and professional growers alike. These systems are either installed where water enters the home or building (point of entry/ POE) or anywhere along the line where it will be needed (point of use/POU) if purified water is not needed everywhere in a particular structure. Water introduced into a reverse osmosis system first passes through a sediment filter to remove large particles, then through a semi-permeable membrane for minute particles. This membrane is able to obstruct the flow of almost all micro-organisms, pesticides, metals, and random particles. Unfortunately, it cannot restrict the transfer of dissolved gasses, but a RO system can generally remove nearly all other foreign or undesired material from getting through. The actual rate of material allowed to pass is proportionate and commensurate with size and type of the membrane, as well as how polluted the water is and the flow rate of said water. Reverse osmosis membranes generally fall into two styles: spiral wound or hollow fiber types. Like anything, each has its advantages and disadvantages. Both types are designed to facilitate osmotic pressure and expose the pretreated water to as much surface area of membrane as each respective or particular system can allow. Hollow fiber membranes have more surface area, but as such they are often prone to clogging more than the spiral wound membranes. They are however easier to maintain. Spiral wound types are better suited for water with high volumes of total dissolved solids. In addition to separate styles of membranes, RO membranes and systems range in their effectiveness of precluding materials of varying sizes. There are membranes that can prevent particles as small as .0001 microns to those that can trap particles as “large” as .1 micron. For purposes of scale, a micron (abbreviation of “micrometer”) is one-millionth of a meter. A typical human hair ranges from less than 50 microns to just over 150 microns. Reverse Osmosis membranes are made from various materials like polyamide thin film composites, or cellulosic types including cellulose acetate, cellulose triacetate, or various blends of each. 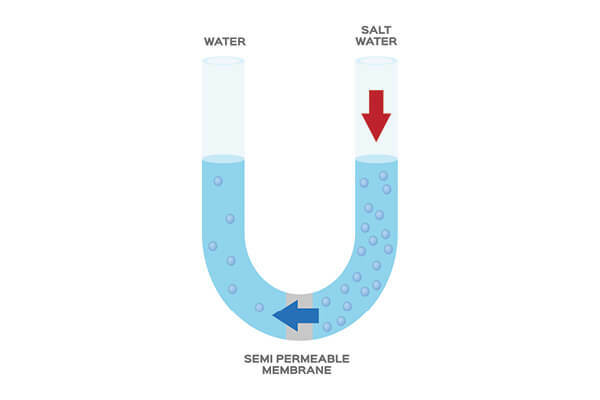 Membranes are also designated by their recovery rate, which means how much treated water they produce as compared to the amount of untreated water introduced to the system. This percentage is simply calculated by dividing the volume of expelled, treated water by the total volume of untreated water entering the system. The efficiencies of these vary, but a household-sized unit may only be in the 20-30 per cent effectiveness range, with the balance of the water (called reject water) being used to flush out the expunged solids which then are diverted into the waste water stream. Maintenance is yet another consideration and distinction between types of RO systems and membranes. Membranes are not permanent inserts. They need to be replaced at least every five years depending on use and sometimes as often as every one to two years. 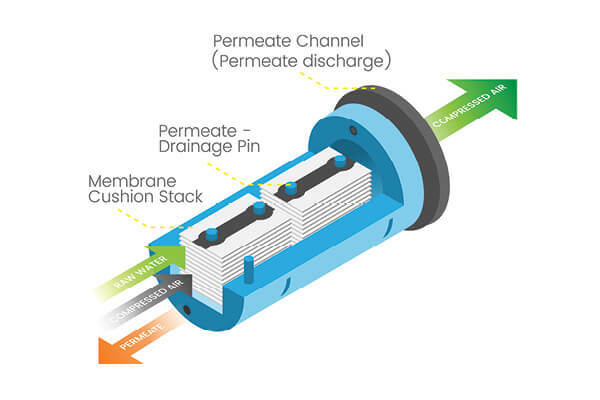 The better the system in place to pre-screen sediments and particles before entering the membrane, the longer the useful life of the membrane. After passing through a membrane of either sort, water in a RO system then generally passes through another filter containing carbon or charcoal to remove any potential unwanted smells. It is then ready to be consumed or is suitable for use in plant production. Why is Reverse Osmosis Used in Horticulture? Plants are particularly susceptible to a wide range of contaminants often found in some water sources. In some cases those contaminants may negatively affect healthy plant growth and in worse case scenarios, the plants can absorb toxins that are then passed along to humans upon consumption of the affected plants. In a wide variety of crop plants, contaminated water may lead to all levels of detriment to a plant. It may manifest itself as deformities, aesthetically displeasing plants (detrimental if the aim is to sell them) such as with salt buildup leading to burning of leaf margins, slow or stunted growth, and the possibility of plant senescence and ultimate death. High levels of solids/salts in irrigation water can also injure plant roots, which will in turn interfere with water and nutrient uptake. Water-borne bacteria that cause root rots and other fungal problem can be eliminated or greatly reduced by using a RO system. In soil culture or in soilless media, the organic matter and some of the inert materials can act as a buffer to collect or absorb some of the contaminants that RO can help to reduce or eliminate. This does not mean no contaminants can or will be transferred, but less so than in growing systems, such as hydroponics, where the water comes into direct contact with the plant roots. For this reason, RO systems are heavily used in professional and commercial hydroponic operations unless frequent, routine water quality testing proves it’s not needed. Growers typically like RO systems because they allow for more accurate dosing of plant nutrients. If the irrigation water starts out with near-zero levels of particles and dissolved solids, such as with RO water, then it should have an electrical conductivity (EC) measure of zero. This means the grower does not have to guess which ions are already in the water that could bind with, and render useless, some of the added nutrients or act as a force multiplier and cause nutrient toxicity because of a buildup of any particular nutrient. Growers and homeowners alike need to beware of the potentially corrosive nature of RO-treated water. Some of the dissolved calcium and magnesium in hard, untreated water, acts as a buffer against corrosion of pipes. With hardness removed from the water, treated water can eat away at copper or galvanized pipes much faster than if it were untreated. For this reason, growers need to make sure if they are irrigating with RO water that their watering lines can tolerate relatively pure water. For growers and homeowners alike with water quality concerns, there are alternatives to RO water. A full, water quality analysis by an unbiased professional or lab should be performed to determine what the potential contaminants are. It may be that an RO system is not even needed to purify water for irrigation or drinking. While test results from private companies selling or servicing water treatment equipment may be accurate, the follow-up recommendations from them may align better with their product lines and inventory than on your actual needs. Various filters, compounds, or even light may be used as an alternative to RO treatment. The carbon filter that RO-treated water typically goes through may in fact be all that is needed to control water issues. Carbon filters control or reduce the presence of chlorine, pesticides, radon, and human-made volatile organics. Sediment filters can be used to control and exclude the presence of soil, sand, other solid particles, and even some biological contaminants like Giardia cysts. Private water supplies can be treated with small amounts of chlorine to control or kill bacteria, hydrogen sulfide, iron, and manganese. Water may even be treated by exposure to UV light to kill certain types of bacteria. There are several other treatment options that don’t require the addition of anything to the water, but rather control impurities by some mechanical or physical means such as aeration and distillation. Like RO systems, each of these potential alternatives have their respective pros and cons and should be investigated as to their likely effectiveness in your particular situation before using.